Moonbeam: Monster Booties Take Over Manhattan!! 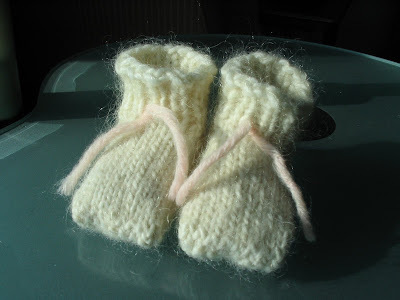 These are the completed booties I mentioned in my last post. I told you they were cute! Do you like how I got the Empire State Building in the background? These booties mean business. 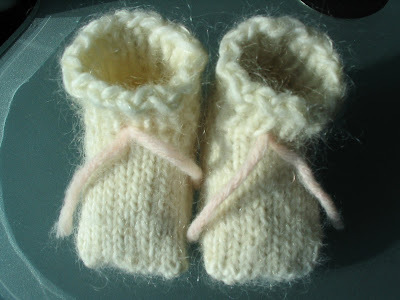 I gave them to my supervisor today...I never get tired of how people react to handknit gifts. Even those who don't have a grasp of the process still appreciate the effort and quality. I also scored a piece of pink & white cake which I'm taking home to my hubby. I also have some leftover Boston cream pie, which came from my company's Boston office. They bet 100 pies that they would win the superbowl, and my office bet 100 cheesecakes they wouldn't. I felt like a traitor eating that pie! Oh well, I may as well be consoled for my loss, right? 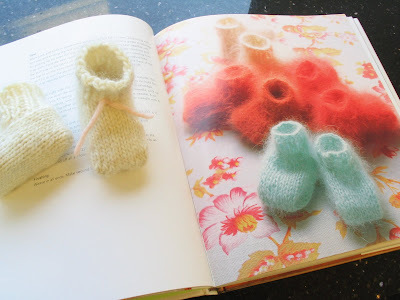 So these booties were knit with Lamb's Pride worsted weight wool/mohair blend. I used scraps of the same brand in pink wool for the detail ties. 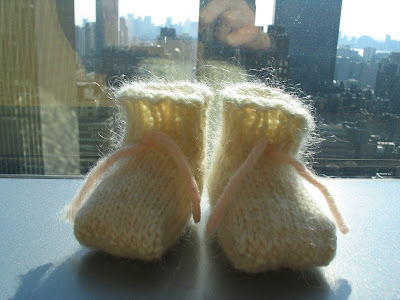 I believe I used #2 double pointed needles to knit these to gauge...the pattern from Last Minute Knitted Gifts called for #5, but also called for angora which I decided against. I'm broke, so I used what I had on hand. I DID want them to be a little fuzzy, so I held some sort of furry thin stuff I bought years ago in Boston along with the worsted. It's the same stuff I used to knit the airy scarf. The effect is to give them a little white cloudy halo, and also a nice little detail up close. Both yarns are white, so the detail is not quite as pronounced as I would have liked. Oh well. At least they're fuzzy. Here are a few more shots of the booties livin' up the city life! 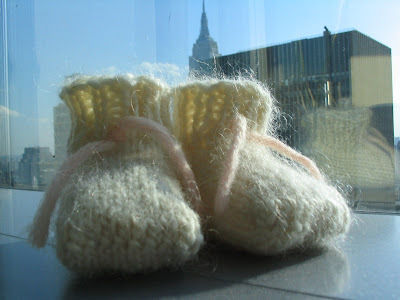 I love your manhattanite style baby booties! I do hope to see some with lots of furries soon! But for who? Maybe a bird will send you some new yarn for your birthday.